The screensaver on my laptop shows the old Venetian harbour in Rethymnon in the rain. It is an image I see every day as I open my laptop and begin to work. But, no matter how familiar and comfortable I am with this photograph for many years, I have seldom seen the Venetian harbour of Rethymnon in the rain. While visitors to Venice are often warned to be prepared to get their feet wet and to use ‘duck walks’ as the rains fall and the water levels rise, the old Venetian town and harbour remain safe places for those who want to keep their feet dry. 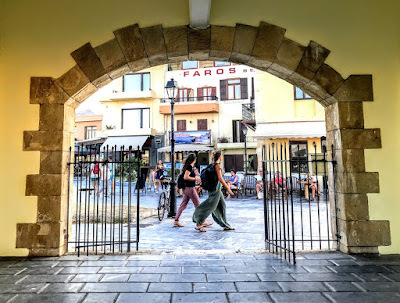 On a few evenings this week, I have walked around the old harbour in Rethymnon, enjoying the changing lights as dusk descended on the scene. 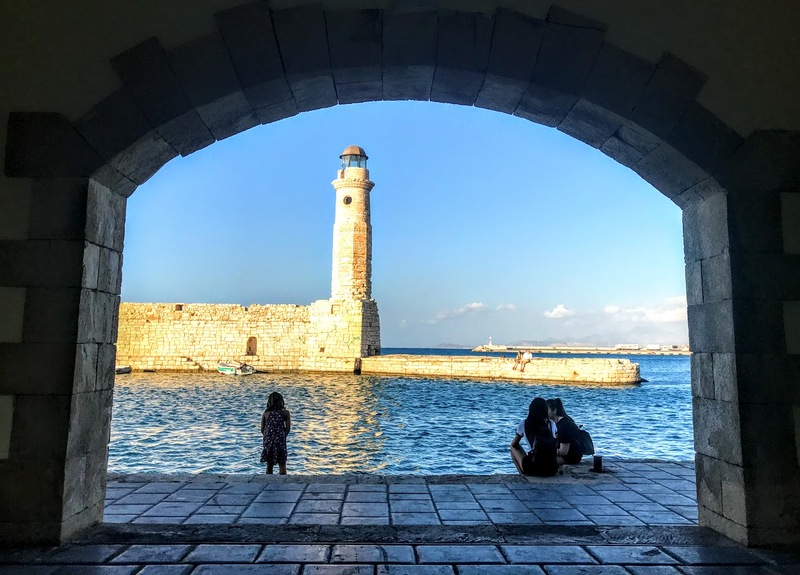 Although archaeological finds show that the Rethymnon was already a prosperous town in the Minoan era and continued to trade in the Byzantine period, the harbour dates from the arrival of the Venetians in Crete. The 13th-century Venetian mole was built to protect the harbour. Since 1300, the harbour has constantly changed and been rebuilt to make it safer and to hold more boats. But, due to the prevailing currents along this stretch of the north coast of Crete, the natural harbour has a narrow basin and a tendency to silt up quickly. In 1582, the Venetians started work on expanding and fortifying the harbour, and some of the vaulted ground floor areas of the buildings may have been used as Venetian boat sheds. The seabed was dredged frequently and a harbour wall was built on the north-east. But the silting problems continued and for a while Venetian engineers considered moving the harbour further west, closer to the Fortezza. However, the projected cost put an end to this project. These unsuccessful efforts mean the harbour in Rethymnon has retained its charming and picturesque character to this day. Most of the harbour buildings were also built in the Turkish period. 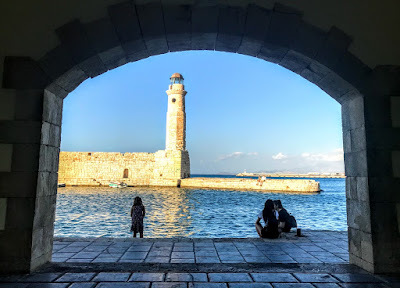 The Egyptian lighthouse at the end of the mole, overlooking the entrance to the harbour, was built during the Ottoman Turkish era, but several repairs in the 19th century have altered some of its original features. The old harbour is now used by just a few fishing and pleasure boats and the floats of the coast guard service also dock here, as well as an old ‘pirate ship’ that offers day and evening trips along the coast. There is a much larger breakwater outside the old harbour, with a new ferry port for ships to Piraeus and Santorini. The quayside is now lined with restaurants, cafés and fish tavernas, many of them in the vaulted or arched Venetian boat workshops. The Venetian and Turkish buildings, with tables lining the waterside and tourists in the evening promenade stepping lightly between waiters and diners, form an attractive summer scene. 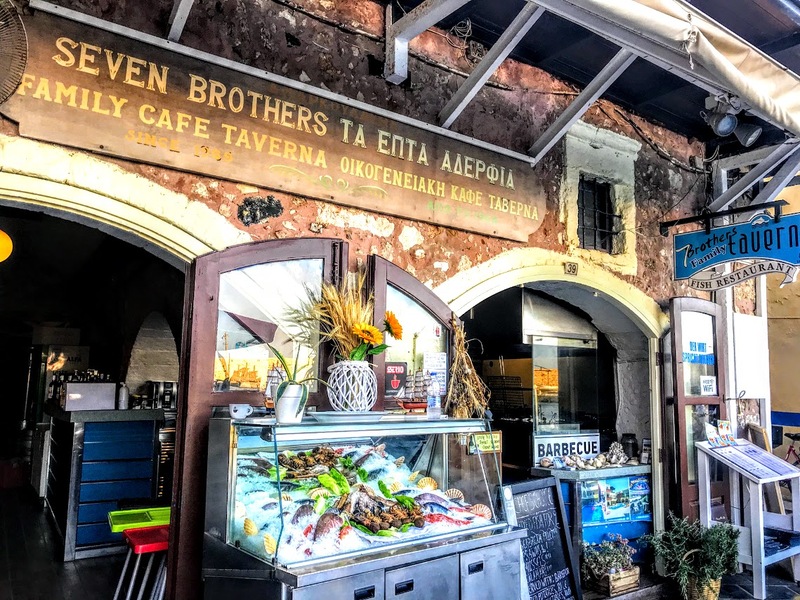 But when winter comes, the restaurants and tavernas will be closed, the tourists will have gone, and only one café will remain open in the evenings at the old Venetian harbour in Rethymnon.